Director – Pete Docter, Co-Director – Bob Peterson, Screenplay – Pete Docter & Bob Peterson, Story – Pete Docter, Thomas McCarthy & Bob Peterson, Producer – Jonas Rivera, Music – Michael Giacchino, Supervising Animator – Scott Clark, Directing Animators – Shawn Krause, Dave Mullins & Michael Venturini, Production Design – Ricky Nierva. Production Company – Pixar Animation Studios/Disney. As a boy, Carl Fredericksen idolizes the exploits of Charles Muntz who explored South America in his airship Spirit of Adventure. Carl meets Ellie, a girl his own age, who also wants to be an explorer and idolizes Charles Muntz. The two form an explorer’s club, grow up together and then marry. They make plans to go to Paradise Falls that Charles Muntz discovered in Venezuela but everyday problems always get in the way of the trip. As they grow old, Carl finally buys a ticket to Venezuela, only for Ellie to fall ill and die. Alone, now aged 78, Carl refuses to sell the house to the developers putting up high-rises all around him. When one of the foremen accidentally knocks down his mailbox, Carl hits him with his walking stick. He is charged by police and orders are issued by the court that he be moved to a retirement village. However, as they come to take him away, Carl inflates hundreds of helium balloons attached to strings and floats the entire house away. As the house heads up into the skies, Carl discovers that he has also carried away Russell, a boy scout who has come trying to earn his Assisting the Elderly badge. Carl grudgingly invites Russell in and they head to Venezuela together. The house comes down in the jungle. Discovering that they can tow the house as it floats on the end of the balloons, Carl determines to move it around the other side of the mesa to the edge of Paradise Falls, just as Ellie always dreamt they would. Along the way, the encounter a strange coloured bird that Russell adopts and names Kevin and a talking dog named Dug. They then discover that Charles Muntz is living there, having created a device that allows his pack of dogs to talk. He wants to capture Kevin, a rare bird that would vindicate the discoveries he was ridiculed over. As Muntz’s true ruthlessness is revealed, it is up to Carl and Russell to save Kevin. 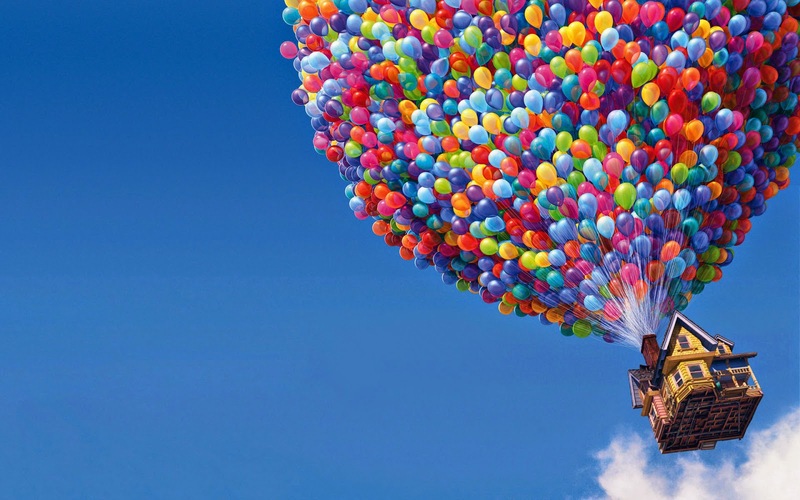 Up was the tenth theatrical release from Pixar Animation, following the likes of Toy Story (1995), A Bug’s Life (1998), Monsters, Inc. (2001), Finding Nemo (2003), The Incredibles (2004), Cars (2006), Ratatouille (2007), Wall-E (2008) and the subsequent Brave (2012), The Good Dinosaur (2015), Inside Out (2015) and Coco (2017), as well as sequels to many of these. It was the first Pixar film to be released into the 2008-9 3D revival fad, although does not need such gimmickry and works perfectly well seen flat. Up should not be confused with Russ Meyer’s decidedly non-family-friendly Up! (1976), which exists at almost opposite poles from this film. The enormous surprise about Pixar is not so much that the company has risen to become the industry leader since its emergence onto cinema screens fourteen years ago or that the computer animation techniques they introduced have come to dominate the field and squeeze out traditional handheld animation, but that Pixar manage to turn out films at such an enormously high standard of creativity and excellence. When you consider almost any other animation studio’s output, there is always the odd flop, miscalculation or effort when they were having a bad year – Disney flopped with efforts like Treasure Planet (2002) or Home on the Range (2004) or their various portmanteaus from the 1940s; DreamWorks put out Sinbad: Legend of the Seven Seas (2003) and Shark Tale (2004), while other animators like Don Bluth and Ralph Bakshi have had largely hit and miss careers. However, there is nothing in the Pixar catalogue that you could say the same about; each of their works is a classic in its own right. [Although this did change after 2010 when they started making lesser sequels to their earlier films]. You go in half expecting that Pixar’s luck cannot always stand. There was a certain negative box-office buzz generated before Up opened – the thinking that if so much of modern cinema and particularly network tv is being pitched to the 18-24 youth market, what interest would there be in a film where the hero is a cranky old man? Happily, general audiences did not seem to care to be judged by such niche labelling and Up defied expectation and went onto become the fifth top grossing film of 2009. If some of Pixar’s films of the last couple of years have been conceptual headaches for the marketing department – a rat that wants to be French chef (Ratatouille), a film about a lonely robot with almost no dialogue (Wall-E), an old man on a walking frame goes on an adventure (Up) – it is to the credit of the brand name that Pixar has created that all of these have been successes with audiences. 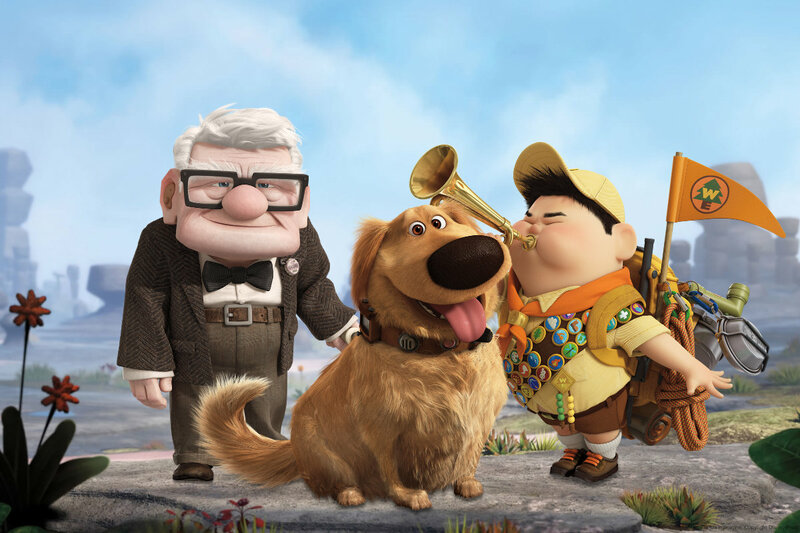 Up succeeds in being yet another winner from Pixar. Enormously so. I cannot think of any other film I have ever seen that leaves one feeling as if they want to cry within the first five minutes. There is an extraordinarily heartfelt magic to the largely wordless montage that depicts the lives of Carl and Ellie from the point of their meeting in childhood through to old age, that comes filled with the charm of imagining shapes in the clouds in the sky, sending balloons with sticks tied to them to the other’s bed to scenes of deeper emotional complexity – the miscarriage of their child and then Ellie’s death. The effectiveness of this sequence comes in the contrast between the boundless excitement of childhood adventure and their slow erosion by the mundanity of ordinary life. Up is very much a film that echoes with the sadness of life dreams lost. There is an equally touching riposte near the end where we discover the adventures that Ellie has filled in in her scrapbook – rarely has the old fantasy cliche about the best things in life being those that we have taken for granted right under our noses been so winningly and disarmingly presented. The characters come perfectly rounded and entirely endearing. Both Wall-E and Up show Pixar evolving beyond the easy comic caricatures that most animated films operate by and creating characters of considerably nuanced emotional depth. These are such that Up is a film with sensibilities that play out far more for an adult audience than a juvenile one. There was a considerable subtlety to the way that Up was marketed, letting audiences see it would be a story about a cranky old man and a boy scout, something you expect would lead to a predictable arc about the boy causing the old man to find his heart again. With this expectation set up, Pixar then slip in under the radar in the first few minutes and deliver an emotionally heart-rending lifestory that is about anything but a cranky old man. The emotional complexities of the earlier scenes eventually give way to good old-fashioned adventure – where the old man on the walking frame improbably starts doing Indiana Jones leaps into action around the outside of a dirigible – but you can hardly quibble about Pixar playing to both sectors of the audience. The film is stolen by the two non-human characters that turn up about a third of the way in – Kevin the bird who moves in a series of highly unusual gymnastic manoeuvres and adopts Russell as its baby, or Dug the dog who is constantly snapping to point or having his attention diverted away in mid-sentence thinking he sees squirrels. What you also have to commend Up for is its sense of humour. It has been rare that I have laughed so much in a film just at the throwaway gags that the director(s) keep throwing in in the background. Be it Russell’s boy scout techniques gone awry – claiming “with this baby we’ll never be lost” as the GPS device in his hand goes flying out the window, or the tent that dolefully goes flying off into the rain after being erected – or images of Russell squeaking across the dirigible window on a rope, and the two old men with arthritic backs trying to engage in a sword duel. The film gets some especially amusing mileage out of the talking dogs – constant references to Russell as “the small mailman”, the image of Dug crawling along after Kevin “Please be my prisoner”, or the side-splitting scene where everyone sits down to dinner served by the dogs who are constantly stealing bites from Russell’s hot dog and leap up excitedly when Muntz innocently mentions the word “treat”. The result is unabashedly one of the most enjoyable films that one has seen in a theatre this year.